I have filled three huge lawn bags with shredded paper today. Hidden among the shreds are the details of my life. I could tell you how much my electric bill was in 1980 if I had spared those receipts from the shredder. I could have assured you that my cat was vaccinated for rabies back in 1983. Or maybe you would be more interested in a document stating my car had passed the emission test in 1990. As I fed these things into the ravenous shredder (which overheated three times), I wondered why I had avoided this task for so long. I have asked our financial advisor, on several occasions, if there was any reason to keep old records. Each time I was gently told, “no” but it wasn’t until today that I took action. Why is it hard to let go of that which is clearly useless? Is it a matter of trust? Am I trying to keep a paper trail so that I can go back to days that were more fun? 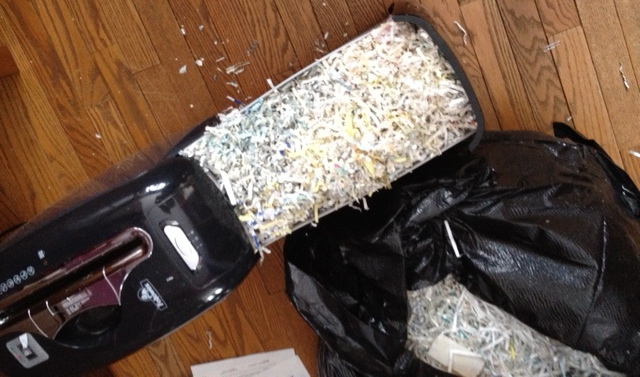 Does shredding the evidence make it undeniable that I have more history than future? I did find a few treasures. I found my original birth certificate, a copy of my ordination certificate, a copy of a document signed by Grover Cleveland in 1886 granting a homestead easement for accessing the timber on our farm and a hand written letter to each of my parents that I never sent. I am glad that I glanced at the papers and grasped ownership of what I was releasing. I feel as though I have traveled back down a road that is both crowded with trivia and marked with significance. All of it is past. None of it can be relived. But I can filter the memories. I can choose forgiveness, gratitude and grace. I can release the pain and embrace the joy. I can follow the footsteps of Jesus where I am reminded that my sin has been shredded and my faith has been framed. This entry was posted in Thoughts and Reflections and tagged documents, faith, forgiveness, grace, Grover Cleveland, life, memories, parents, shredding. Bookmark the permalink.